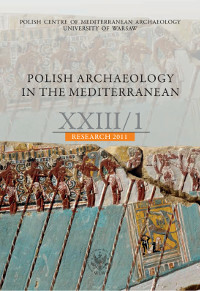 The journal Polish Archaeology in the Mediterranean, published by the Polish Centre of Mediterranean Archaeology, University of Warsaw, has provided a forum for presenting the results of extensive work by teams of Polish archaeologists and related specialists, associated with the PCMA and with various other research institutions in Poland and abroad. For the past quarter of a century it has grown and evolved, including not only regular reports on fieldwork, but also studies on specific topics related to the fieldwork, reflecting the scope of work undertaken under the aegis of the PCMA in the Eastern Mediterranean and North Africa. Developing cooperation with countries in the region, such as Kuwait, Jordan, Saudi Arabia and Armenia, among others, has given impetus to a broadening of studies of the ancient world, if not in the temporal sense, then at least territorially and thematically. Reports on current work continue to form a major part of each issue and this is true of the PAM 23 volume, published in 2014. The first of the two fascicules making up the volume is traditionally devoted to articles detailing the results of archaeological excavations and survey work, as well as extended conservation projects conducted on sites that cover a range of time from the Bronze Age to late medieval times. Eleven of these sites are in Egypt (Alexandria, Marea and Marina el-Alamein on or near the Mediterranean coast, Tell el-Retaba, Tell el-Farkha, Tell el-Murra in the Nile Delta, Saqqara, Naqlun in Fayum Oasis and Deir el-Bahari in Upper Egypt, the Oasis Dakhlah and the Red Sea harbor of Berenike), three in Sudan (Old Dongola, Banganarti and el-Zuma) and one each in Cyprus (Nea Paphos), Lebanon (Beirut) and Syria (Palmyra), as well as the region of Al-Subiyah in northern Kuwait. A growing part of the fascicle is taken up by studies related territorially and/or topically with research objectives of the PCMA. Authors in this section are recruited from among team members, but are also independent scholars invited to study the material. In the current volume, authors with affiliations in 24 institutions are among the contributors. Three of five articles are devoted to a study of pottery, ranging from technological issues in the Early Bronze Age (Tell Arbid in Syria), through a contextual review of a horizon of more than 600 years of ceramic production at the monastic site of Naqlun in Egypt, to a preliminary typological assessment of clay basins from early Islamic Bijan Island in Iraq. Typological and distribution issues are discussed on an assemblage of marble vessel fragments from Jiyeh in Lebanon. The fifth paper discusses the construction of Hellenistic fortifications, the only substantial defenses with confirmation in the archaeological material from the Ptolemaic Red Sea harbor of Berenike. The electronic versions of all articles from this volume are available in full color from the CEEOL online archive.